At the Whiskas® brand we help nurture your cat at every stage of her life with meals she'll instinctively love. That's why we use quality ingredients to create delicious recipes that keep your cat happy and healthy. Our delicious Casserole with tender, succulent chunks, cooked to perfection, is so irresistible it will make your cat rush to the bowl! Developed with our experts at Waltham™, a leading world authority on petcare and nutrition, each cat food meal is complete and balanced to help you provide the best possible care for your cat. And with our variety, she can enjoy something different each day. WHISKAS ® 1+ Cat Pouches Casserole Poultry Selection in Jelly 12 x 85g is rated 4.7 out of 5 by 616. Rated 1 out of 5 by DorsetDi from My cat walked away. Tried the new poultry casserole pouch for our cat, who normally isn't at all fussy and will always try new food - but this time I'm afraid he just turned and walked away. Waste of money I'm afraid. Rated 5 out of 5 by REEBOK57 from Casserole tastes ! Our cat was becoming bored of her usual cat food so we thought of trying something else ! We bought Whiskas casserole pouches and she loves it .... not a bit left in her bowl .. Thank you whiskas ! Rated 5 out of 5 by elcia_o from My cat just loves it! I had a sample pouch that came in with other 12 pack. My cat usually leaves some food in the bowl but the chicken casserole was gone in full - this says everything. I am definitely going to stock up on the casseroles! Rated 5 out of 5 by Cinnie11 from Juicy chunks Both my cats enjoyed the tasty chunks and the creamy soup of this cat food. Rated 5 out of 5 by Gerryg from casserole Bought this last week and my cat can't get enough of it. She is a fussy eater and turns her nose up at most things, plus has a digestive problem. She has not been sick once!! Rated 4 out of 5 by AlanS from Suitable for fussier cats! My cat won't touch the 'standard' Whiskas, but after receiving a free sample of this product she quite happily wolfed it down. Naturally I ended up buying more boxes, and when they went to a multibuy offer, I ended up stocking up. Unfortunately, as soon as I did this my cat then decided she didn't like them. Overall the casserole range is certainly suitable for cats with fancier tastes - it's just unfortunate mine got fed up after I bought so much of it. Rated 5 out of 5 by Natalie34 from Awesome range of new 'Casserole' cat food I recently purchased the usual Whiskas jelly food pouches as my cat won't eat any other brand and received a free sample of the Casserole pouch. My cat enjoyed it so much and so will continue to buy this range. Thank you very much. Rated 5 out of 5 by carolyn from Good jelly My older cats love the jelly; and the younger one finishes of the lumps1 The neighbour's very older cat helps himself to an extra meal! Rated 5 out of 5 by Lizzzz from sCrumptious ! Our charming cat Chester was curious about the new casserole . He cautiously crept up to his ceramic dish . After careful consideration , Chester completely consumed the casserole . He then sat in contented contemplation on his cushion , and concluded that he had just had a cracking good meal. Rated 5 out of 5 by CathABart from More please! Empty dish and then asked for more straightaway! Can't ask for a better endorsement than that! Rated 1 out of 5 by Joy of my life from Not for my cat. I only bought this two days ago after a free sample came in the post. Although fussy she seemed to like it. Not now !! I have tried it with bits on, crushed cat treats but nothing works. The cat over the road is doing very well on left overs but that is no consolation to my pockets. Rated 5 out of 5 by Tatty head from My cats loved it I brought this last week and my cats really enjoyed it. Rated 4 out of 5 by Taggart31b from Empty plate Tried as a result of a free sample with money off coupon. Money well spent. Rated 5 out of 5 by uklass33 from Mr Rae's favourite I've always bought whiskers for my cat he loves the full range of products. Rated 4 out of 5 by geriann from my cat approved my cat liked this product, but he'd like it even more if it had more gravy. he loves any cat food with gravy/sauce, which is why i usually buy your products that have gravy or creamy sauce. Rated 1 out of 5 by Cat star from Cat is disgusted My cat turned her nose up at this product every time and the food ended up in the bin. It's a waste of money and needs to be altered. Rated 5 out of 5 by SarahW from All change for Molly When Molly who is now 4yrs old came from the rescue centre we were told that she'd eat anything but in fact Molly decided that in her new home she would become a very fussy eater only dining on one particular brand (not Whiskas) and only then the gravy version which isn't always available. Luckily one day the postie arrived with a free sample of Whiskas Poultry Casserole so despite it being in jelly decided to offer it up to her majesty! Well what a joy, Molly found it delicious and promptly delved in to her new found favourite food. Thank you Whiskas for bringing out this range of casseroles which are readily available at a reasonable price. If Molly could issue knighthoods then you'd certainly be on her list. 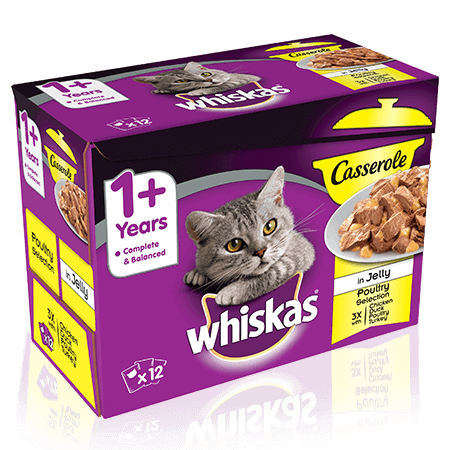 Rated 5 out of 5 by KatieJ from Whiskas Casserole We tried our 4 with the new casserole and they Absolutely loved, ate the lot and asked for more! Rated 4 out of 5 by Debsie123 from Great texture I received a fee sample pouch of this from Tesco and I have to say my cats loved it. It had a pleasant smell and a meaty texture. I would definitely buy this in future. Rated 5 out of 5 by Bethan from Kitty cats Cats go mad for this stuff. Always excited for meal times with this. Rated 5 out of 5 by Kittymollie from Cats love it Had a sample of this sent to me and my cats love it as much as their regular Whiskas. Rated 4 out of 5 by Jen10016 from Nice and moist Tried this a few months ago as we were struggling to find something our kittens would eat- many other options seemed to dry. The casserole pouches are generous with jelly and our kittens seem to really like that. The meat also seems more flakey and less dry than other products. The price was quite high from where we bought the product though. Developed by our experts at Waltham, the world's leading authority on petcare and nutrition.